The first RAAF C-27J has flown. 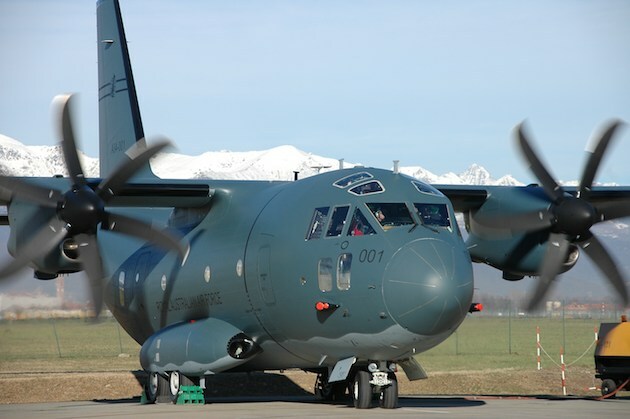 The RAAF’s first C-27J Spartan tactical transport aircraft has completed its maiden flight in Italy. DMO chief executive officer Warren King stated that the milestone represents a major step towards enhancing airlift capability. King said in a statement that the C-27J program remains on budget and on schedule, with the first two aircraft due to arrive in Australia in 2015. I think the semi-matt grey/green upper/side surfaces will be a suitable compromise for overwater and over jungle camouflage, much as the semi-matt light grey is suitable for P-3 camouflage. Note that most USAF aircraft also use a single colour (grey) for camouflage. Is the main colour a grey with a greenish tinge or is it just the lighting? If it does have a greenish tinge this should look great! It’s dark grey upper, the same as the C-130s. It just looks green in the right (wrong?) light. The colour is probably in line with the new navy colour schemes. Gone are the old north Atlantic Grey and new green is in. Perhaps this is the first view of that colour scheme. Colours look exactly the same as the C130J/H colour scheme, “Blue Grey” and “Dark Grey”. They don’t blend the two colours like on the Hercs and I think not stopping the scheme before the radome looks weird. The RAAF opted not to have it fitted because the aircraft would be unlikely to fly distances where it would be needed. The frames will be plumbed so the probe can be fitted later if required. It is actually cheaper to land and refuel than to launch a tanker mission to refuel mid-air.